December 11, 2006 - Christmas is approaching, and the focus of much news will be on Bethlehem, a city important to both Christians and Jews. Palestinians have long tried to use Bethlehem for propaganda. The most notorious incident occurred in 2002. In the spring of that year Israeli soldiers were pursuing dozens of Palestinian terrorists, some heavily armed and known to have killed Israeli civilians. 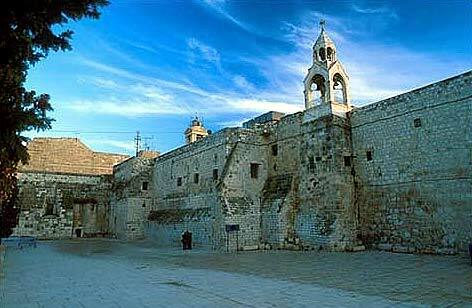 The terrorists took refuge in the Church of the Nativity, holding hostage some 40 Christian clergy and nuns. They had long had a plan to use this Christian holy place as cover, and they put their plan into effect. Israel demanded custody of the terrorists, but the Palestinian Authority refused. Shots were exchanged, but the Israelis did not attack the church and did not try to enter. There was a standoff. Eventually the terrorists got away. Not uncharacteristically, the Palestinians lied about what happened, playing on prejudice to degrade Israel in world opinion. Yasser Arafat accused Israel of an "atrocious crime... that cannot be forgiven." He called the Israelis "terrorists, Nazis, and racists" and called upon the international community to take action. The terrorists set a fire in the church, stole gold crosses, destroyed shrines, and committed other vandalism. They used Christians trapped inside as human shields. The Palestinians desecrated the church, then accused Israel of perpetrating an atrocity. They capitalized on fear of Israel to deflect attention from their own abuses. Bethlehem was once a Christian city. No more. Especially since 1995, when the Palestinians took control of Bethlehem under the Oslo Accords, life for Christians there has become increasingly difficult. Previously Bethlehem had been 80% Christian. By 1990 it was down to 60%. Now it is 80% Muslim. Arafat greatly increased the Muslim population of Bethlehem. He appointed a Muslim from Hebron as Bethlehem's governor. He fired the City Council, which consisted of nine Christians and two Muslims, replacing it with a council of 50% from each group. Christians were eliminated from most political positions. The PLO took control of the Church of the Nativity and evicted Christians from other religious institutions. Recently one Muslim city councilor, Hassan al-Masalmeh, declared plans to institute Islamic law in Bethlehem, including the jizya tax on non-Muslims mandated by the Qur'an: "We in Hamas intend to implement this tax someday. We welcome everyone to Palestine but only if they agree to live under our rules." Palestinians also encouraged Christians to flee through intimidation. At rallies they would shout, "After we do away with the Saturday People, we shall take care of the Sunday People." Mosques were built taller than nearby churches, replicating the practice of Saladin. Church schools were forced to add Islamic and reduce Christian studies. Christian religious services were intentionally disrupted by the loud public broadcast of Muslim sermons. Christian cemeteries, churches, monasteries, and convents were desecrated and some of their land confiscated. Christian women were harassed in public, threatened, and even raped. Christians who dared to protest were accused of collaborating with Israel and some were shot. Christian businesses used to flourish in Bethlehem. Muslim terrorists beat Christian merchants or made them pay protection money. They forced many Christian stores to close. Other Christian businesses failed because of a Muslim boycott. It is no wonder that Christians left Bethlehem in huge numbers. While Christian Arabs continued to flee Palestinian-controlled areas, since 1948 the Christian community in Israel has more than quadrupled. Christians enjoy far more safety and freedom in Israel than they do in Palestinian lands. Bethlehem, once a vibrant symbol of Christianity, has become inhospitable to Christians. Then the king will say to those at his right hand, "Come, you that are blessed by my Father, inherit the kingdom prepared for you from the foundation of the world; for I was hungry and you gave me food, I was thirsty and you gave me something to drink, I was a stranger and you welcomed me, I was naked and you gave me clothing, I was sick and you took care of me, I was in prison and you visited me." Then the righteous will answer him, "Lord, when was it that we saw you hungry and gave you food, or thirsty and gave you something to drink? And when was it that we saw you a stranger and welcomed you, or naked and gave you clothing? And when was it that we saw you sick or in prison and visited you?" And the king will answer them, "Truly I tell you, just as you did it to one of the least of these who are members of my family, you did it to me." All would benefit, not Christians only, if such values could be restored in Bethlehem. This Christmas season, when the Palestinians spread more lies about "apartheid Israel," remember the little town of Bethlehem. "Arafat's Outrage at Church of Nativity Fire." Ananova.com, May 2, 2002. Ettinger, Yoram. "The Islamization of Bethlehem by Arafat." Ariel Center for Policy Research, December 25, 2001. Frankfurter, David. "Chirac Pulls Short Straw on Gaza Human Rights." May 31, 2006. Rehov, Pierre. "Holy Land: Christians in Peril." Documentary film, 2005. What Happened at the Church of the Nativity in April 2002? PalestineFacts.org. Weiner, Justus Reid. "Human Rights of Christians in Palestinian Society." Jerusalem Center for Public Affairs, 2005. Williams, Megan. "Palestinian Treatment of Christian Arabs." The Prism Group.